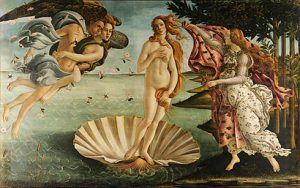 Aphrodite Goddess of Love and Beauty, is also known as Venus depicted here in Botticelli’s “Venus rising from the sea”. It would be hard to think of love without the image of Aphrodite coming to mind. Sigmund Freud saw her symbolically as “one of the most important of all of life’s forces.” And it is said her beauty sparked many wars! Tis said, Aphrodite was born out of the foam off the Isle of Cyprus, the beloved daughter of Zeus and Dione. Venus had two aspects: she was an earthly goddess who aroused humans to physical love and she was a heavenly goddess who inspired intellectual love in them. Aphrodite had many lovers but the story of Eros and Psyche is one of karma and ego. It seems Aphrodite was upset over the attention Psyche was getting from admirers so she enlisted the help of Eros aka Cupid also her son to make Psyche fall in love with the ugliest person he could. Upon seeing Psyche and her great beauty and gentle nature, Eros fell madly in love with her. And we shall save the story of Eros and Psyche for another adventure. While beauty may have evolved into something quite different from the ancient days, the desire for love and lust remain the same. And we are constantly trying to attract both in our lives. This Valentine, think sensual, think passion, think fun and relaxation! Be your own Aphrodite, without the clam shell of course. Below is a recipe for making your own Aphrodite oil~~ be sure to use it sparingly. aphrodite, aphrodite oil, beauty, love oil, sensuality, valentine romance, venus. Bookmark.